Have you read the latest issue of World of Tanks Magazine yet? 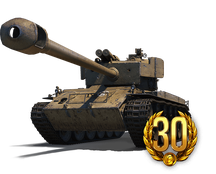 Other than awesome tank-related news, there's also a special offer for a Premium Shop package! Download the magazine and enjoy the articles. Do keep an eye out - there are cool Premium Shop deals like that appearing in the news from time to time. The T26E4 Super Pershing is an American Tier VIII premium medium tank which has improved armour in comparison to the M26 Pershing. It is even possible for some shells to penetrate the spaced armour without the tank taking serious damage. The tank's DPM and accuracy are decent.